The teams featured a broad range of products including a car engine, a bicycle, a wind turbine, and a Leonardo da Vinci-inspired ornithopter. "We have found MSC's SimXpert simulation software to be a very useful educational tool." At Purdue University, we recently incorporated MSC's SimXpert software into our Computer Graphics Technology (CGT) curriculum for the Fall 2009 semester. 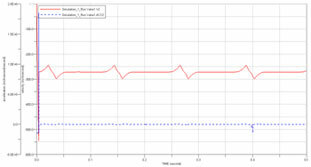 We applied SimXpert in our CGT 426 course "Industrial Applications of Simulation & Design Visualization". While many universities utilize MSC products as their means to an end, we actually teach the use of SimXpert as a core component of simulation. As the syllabus says, "This class focuses on helping our students understand the intrinsic components of computer simulation as well as various aspects of its applications in a product's lifecycle, so that they may be equipped with the necessary knowledge and skills to become leaders in this area". The objective of this course is to give students the ability to conceptualize and model the post-design lifecycle activities of engineering products. Students extensively utilize digital prototypes to enhance the processes of engineering design optimization and verification. We apply the fundamentals of simulation to realize the philosophy of Design-for-Assembly and Design-for-Manufacturing. Students develop skills of communication and project management through written assignments, as well as individual and team projects. For one of our projects, the students were instructed to create an original CAD assembly (such as shown in Figure 1). 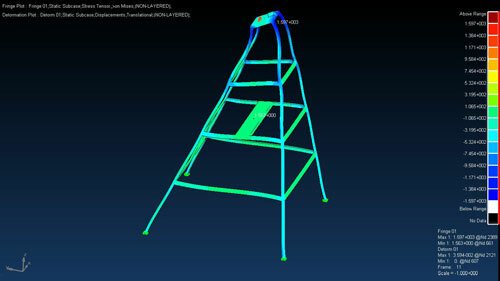 The students were then to import the 3-D solid model into SimXpert and perform a simulation of the product in action. The students formed five design teams. Each group designed an assembly in CATIA and then imported the geometry into SimXpert. Then we utilized the SimXpert Motion workspace to simulate the projects in operation by applying motion connectors to generate movement (Figure 2). We then switched over to the SimXpert Structures workspace to perform finite element analyses (FEA) by applying forces to the model and testing structural integrity. The final results from other teams featured a broad range of products including a car engine, a bicycle, a wind turbine, and a Leonardo da Vinci-inspired ornithopter. 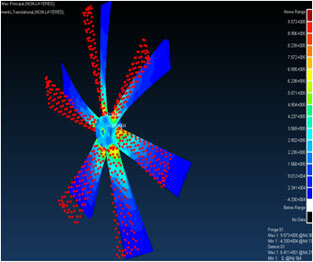 By utilizing the integrated, multi-disciplinary analysis capabilities of SimXpert, one set of students were able to analyze multiple aspects of their wind turbine design such as range of motion, maximum wind speed that the wind turbine will tolerate, and blade load limits (Figure 3). Once the teams had completed simulating their creations, they then created a tutorial on the methodology and processes they used to create their simulations. 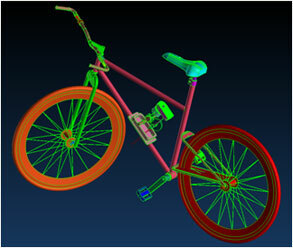 The tutorials were made to allow any user to import a model and create a sophisticated simulation of it. We have found MSC's SimXpert simulation software to be a very useful educational tool. We were able to expose our students to powerful technology that they will see and apply in industry to solve engineering problems. The experience they gain from this course will benefit them as they move on and begin their careers in the engineering field.